America's food demographics, like its melting pot, continue to change. Our lifestyles, culture and eating habits are increasingly more multicultural and diverse. We uncover new demographic data on some of the changes in taking place in the U.S. with regard to food. The same demographic changes that are repainting the American portrait are having a great impact on food and beverage products. The middle class is shrinking, and so is the average household size. New waves of immigrants are bringing new cuisines, and at the same time millennials are seeking new dining adventures. Food-related demographics from the Hartman Group (www.hartman-group.com) suggest there is no longer a "generalizeable" American family. "The American household is undergoing dynamic changes. Ours is now a melting pot of cultures, ethnicities, beliefs and values, and America's households have come to reflect that diversity," the research firm stated in a September article. "The new household structure reflects profound alterations in a variety of demographics, such as who we are, who we live with and where we live." 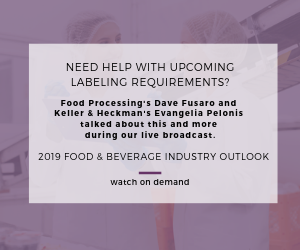 Food and beverage processors use such demographics to find out what ingredients and formulations they'll need as food preferences continue to evolve. And their marketing departments reshape company strategies based on revised and emerging ethnicities, ages and household sizes. For food and beverage companies, the challenge has never been greater in predicting which products will have enough appeal to gain mainstream acceptance. Already, they're adjusting for a variety of diets to offer something for everyone. The traditional family structure of a married heterosexual couple with children is no longer accurate, Hartman Group points out; nor will it ever be again. Most households today are child-free. Those with families now live in less communal households, driven increasingly by the whims of individual desire, not family routine. "And if any single thing defines family structures today, it's diversity, and the fundamental lack of any one dominant type of family structure is emblematic of the new normal," Hartman research points out. Women's roles in the labor force, including leadership positions, have grown dramatically, notes Pew Research Center (www.pewresearch.org), Washington. More women have joined the workforce over the past 50 years, and men's and women's domestic roles have changed dramatically with an impact on behaviors, including shopping. Mothers became the sole or primary breadwinners in a record 40 percent of all households with children in 2011, adds Pew Research. The reaction from food and beverage companies has been to consider at least some marketing to men, who often do the shopping, and to plan on shoppers making more but smaller trips to the store. And food companies have been increasingly building-in convenience to help busy people get meals on the table quickly and easily. Pew Research also finds the share of adults who have never been married at an historic high, as is eating alone, which has steadily increased to the point that it comprises almost half of all eating occasions. How old are we? Most of us (66.2 percent) are between 15 and 64, while 19.4 percent are 14 and under and 14.4 percent are 65 and over, census figures show. The ends of the income spectrums are growing, while the middle class is dwindling, and has been since the 1970s, Pew Research notes. The middle is down to a 43 percent share of the U.S. household income versus 62 percent in 1970. Consequently, the buying power of upmarket consumers and their influence on food trends and culture overall is growing. The move to quality, premium experiences is increasingly influential. Familiar foods and beverages in large volumes for the lowest possible price are being replaced with "premium" foods, Hartman's A.C.T. (anthropology, culture, trends) forecast says. "People will pay more for higher-quality food and beverage experiences on everyday occasions," the forecast says. That's one reason the large, mainstream food companies are buying emerging brands in the premium space. Immigrants and their U.S.-born descendants are expected to provide most of the population gains in the decades ahead. Hispanic and Latino Americans accounted for 48 percent of the national population growth of 2.9 million between July 1, 2005 and July 1, 2006, according to the Census Bureau. Much of this change has been (and will be) driven by immigration. Nearly 59 million immigrants have arrived in the U.S. in the past 50 years, mostly from Latin America and Asia, Pew Research reports. Economic growth is being driven by Hispanic and Asian consumers, to the tune of nearly $2 trillion per year, according to the Selig Center for Economic Growth at the University of Georgia (www.terry.uga.edu), Athens, Ga. "The biggest change I've seen is the increased focus on Hispanic estimates after Census 2000," explains Jeff Humphreys, Selig Center's director. "That was a wakeup call to corporate America. Many companies found they were behind in terms of targeted market efforts to Hispanic consumers." But that's subsiding. Hispanics currently comprise about 47 percent of U.S. immigrants, but since 2007, immigration from Latin America has declined, especially from Mexico, according to Pew Research. Now the Asian population is the fastest growing, set to become the largest annual immigrant group in the U.S. sometime between 2045 and 2055, according to Pew research. However, Asians will barely make it into third place in the total population by 2065, comprising 14 percent of the full American melting pot. "There are just more Asian consumers [in the U.S.] now, and their buying power has held up better than that of other groups," Humphreys adds. The number of Muslims may be growing fast but their numbers remain small. Estimates from Pew Research show there were about 3.3 million Muslims of all ages living in the U.S. in 2015, meaning Muslims made up about 1 percent of the total population (the current U.S. population is about 322 million). But that figure will likely double by 2050, causing some companies to look at halal certification of their food products. Halal is the dietary standard for Islamic food preparation, as prescribed in the Koran. Animals must be slaughtered in specified, humane ways after a prayer. Foods must be free from any component Muslims are prohibited from consuming according to Islamic law. It's very similar to Jewish kosher law. "Halal has been around for decades and has been increasing in popularity every year," says Roger Othman, director of consumer relations at the Islamic Food and Nutrition Council of America (www.ifanca.org), Chicago. "Halal appeals to Americans because it's wholesome, pure and offers the opportunity to experience a variety of foods from different cultures." Muslims enjoy cultural dishes from their ethnic origin, as well as American fare and foods, such as hot dogs, hamburgers and pizza. "They just want it to be halal," Othman notes. Many ethnic food companies began by marketing to a niche but now are pursuing a much broader audience. Such was the case at Ruiz Foods, Dinuba, Calif., a 50-plus-year-old company that develops authentic Mexican food products. Ruiz Foods (www.elmonterey.com) began by selling items like enchiladas, tamales and burritos, and largely to a Mexican immigrant audience, but now the company's audience has broadened. At first, these new customers were just beginning to learn about Mexican food, so the flavors were fairly simple and straightforward, says president and CEO Rachel Cullen. Soon, they experimented with flavors, textures and heat levels through exposure to taquerias and family-owned restaurants. "We then began to introduce a variety of different flavors and new products," Cullen explains. Today, Ruiz Foods' demographic research recognizes the huge growth in millennials. "Millennials are heading into the 'school-age parents' stage, an important life stage for prepared food products," she says. "The significant growth among Hispanic consumers is an important trend that will continue to positively affect our company." Coinciding with the influx of Asian immigrants, the Asian food market has grown significantly, and now influences more specific and authentic cuisines such as Korean, Vietnamese, Thai, Hainanese and Malaysian. Today, people are more willing to try different dishes, new textures and bolder, hotter, spicier, more exotic flavors, says Mike Kan, sales manager at Golden Island Jerky Co. (www.goldenislandjerky.com), Rancho Cucamonga, Calif.
"There are several ways to target different demographic groups," Kan says. In ethnic markets, some customers look for authentic brands that remind them of "home," he mentions. "Within the Asian community’s culture, status issues and face-to-face relationships come into play." "The great curiosity in Asian cuisine across all demographics is impressive," adds Steve Montes, general manager of sales and marketing-U.S. mainstream and Americas at Lee Kum Kee (www.lkk.com). To accentuate its exotic Asian flair, the company recently rebranded its Panda line of ready made sauces, which include Korean BBQ Stir Fry, Kung Pao Chicken and Mongolian BBQ Stir Fry. "We want consumers to see the beauty of Asian meals and flavors as the popularity of Asian cuisine grows," he says. "The U.S. population has continued to diversify, and consumer palates have indeed become more adventurous. Consumers ask for more flavors from Asia, not just in traditional Asian recipes but even in tacos, pizza, burgers and salads." He especially credits millennials and adventuresome baby boomers. CJ Foods, which makes Annie Chun's (anniechun.com) pan-Asian foods such as soup and noodle bowls, strives to find a balance between the complexity of authentic Asian flavors and convenience for American cooks. "Millennials seek what's on-trend over what works well with their unique lifestyle," says Jennifer Yoo, marketing communications manager. "Food brands make changes to accommodate such demands. Our products aim not only to reach the largest audience possible, but to bring the authentic Asian flavors to American kitchens." A national survey of 1,800-plus shoppers by the Private Label Manufacturers Assn. reveals millennials love food but want it made their way. Fresh, healthy and organic foods are at the top of their shopping lists, while prepared and portable foods are also very popular. Millennials and the growing Generation Z (17 and under) are the most ethnically diverse age groups, which means they incorporate eating habits from many different cultures, the Hartman Group suggests. "This influences their dining habits and food choices, allowing them to seek an array of ingredients available even at the most basic of grocery stores." While millennials are now the biggest group (totaling 83 million people, nearly 26 percent of the U.S. population), baby boomers and Gen Zs currently each represent about a quarter of the population. Both are shaping food culture to be more diverse and experiential, according to Melissa Abbott, the Hartman Group's vice president of culinary insights. Boomers see food as a way to increase their longevity and quality of life, while Gen Zs look for food that's ethnic and innovative. Gen Z is also the first generation to completely grow up in the digital age, and is the most ethnically diverse age group to date, adds Hartman Group. More than any other age group, this one cares about healthy and organic food and wants transparency in labeling. "These are truly exciting times, and it inspires our product development team," says Meera Vasudevan, executive vice president and cofounder of Preferred Brands International, Stamford, Conn., which produces the Tasty Bite (www.tastybite.com) line of organic, vegetarian/vegan Asian, Indian and Thai meal offerings. "The Gen Z segment was practically born for complex flavors. They have been exposed to new foods from early childhood, and will be even more sophisticated, demanding more authentic global flavors than millennials," she says. Home-delivered meal kits, what Vasudevan calls speed-scratch cooking, are gaining popularity. They're one reason her company recently launched Tasty Bite Spice & Simmer cooking sauces. The easy-to-use kits feature whole spices, marinades and simmer sauces to create a gourmet Asian or Indian dish in 30 minutes or less. Meanwhile, we're all getting older. Population growth will slow to 2050, both in the U.S. and globally, Pew Research reports. Baby boomers already are looking for foods to keep them healthy as they age, and subsequent generations likely will follow suit. Bournemouth University (research.bournemouth.ac.uk) believes that could be why the medical foods industry growing. Nestle and Hormel are leaders in developing foods to manage and treat chronic illnesses. The "food as medicine" concept may be used to formulate foods that treat certain deficiencies. Bournemouth suggests older consumers often lack sufficient protein, which could be attributed to challenges in eating and digesting certain foods, reports lead researcher professor Katherine Appleton. "Older adults were most likely to eat different types of animal protein if they were tasty, affordable and convenient to buy and prepare," she states. NPD Group notes demographic and behavior changes in how people eat. Single-person households, now the largest segment, are an attractive and underserved niche.